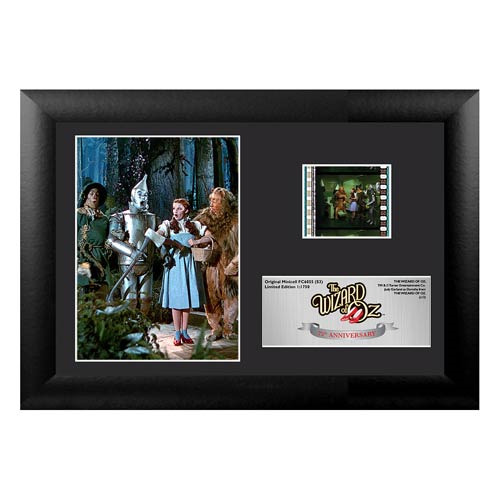 Celebrate the 75th anniversary of the film The Wizard of Oz with this special edition collectible film cell. Features a classic image of Dorothy, Tin Man, The Cowardly Lion, and Scarecrow! The Wizard of Oz 75th Anniversary Series 3 Mini Cell measures 7 3/4-inches wide x 5-inches tall. Perfect for displaying in your home or at the office, all the elements are framed in black wood and includes a certificate of authenticity. Please note: The actual strips of film vary from piece to piece, as they are hand picked from reels of film. We cannot accept requests for specific strips, nor can we accept returns on opened items. The cell strips you receive may be different from those pictured. Ages 14 and up!